Violets are cheery, early blooming perennials that welcome the advent of the growing season with daffodils, tulips and other spring bulbs. However, these cool climate woodland plants do best in partial shade. Violets are versatile, and growing violets in containers is no problem at all. 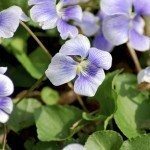 Want to learn how to plant violets in pots? Read on. Violets are readily available in most garden stores, but it’s easy to start violet seeds indoors about 10 to 12 weeks before the last expected frost in your area. Violets are relatively slow to germinate. Simply fill a planting tray with a good quality potting mix (be sure the container has at least one drainage hole). Sprinkle the seeds lightly over the surface of the soil and cover them with 1/8 inch of potting mix. Water well. Cover the tray with black plastic and place it in a warm room with temperatures at about 70 degrees F. (21 C.). Water as needed to keep the potting mix lightly moist, but never soggy. Once the seeds have germinated, remove the plastic covering and move the tray to a bright window or place the seedlings under a grow light. Thin the violets by snipping weaker seedlings at the soil line when the plants have at least two sets of leaves. Seedlings should be 6 to 8 inches apart. Transplant the violas into larger containers when the seedlings are large enough to handle. Container care for violets is easy. Harden the young plants in a protected location for a few days before moving the container to its permanent location. Once established, potted violet plants require very little care. Place the containers in a sunny area when the weather is still cool, and then move the plants to a semi-shady area when temperatures begin to rise. Feed potted violet plants in spring and fall, using an all-purpose garden fertilizer. Violas are usually very pest-resistant, but if you notice aphids, spray the potted violet plants with insecticidal soap spray or neem oil. If slugs are a problem, wrap the rim of the container with copper strips.